I wanted to post photos of the nursery today, I really did. Perhaps if I had one of those babies that, you know, slept, I could get some things done around here. Eleanor’s a doll, but she’s not familiar with the whole nap concept. The nursery photos are forthcoming, I promise. Previous Post Have You Voted Yet Today? Those socks are adorable! Might I ask where you got them? Also, my son was never good at the nap thing either, but now he’s better (almost 2). Does she sleep well at night at least? O.K., not nursery photos but love the argyle socks! I’m voting for you. Been reading your blog since the Chicago Tribune story. We have a 1921 arts and craft house in Crown Point, IN. It is an Aladdin kit house. The woodwork and builtins are fabulous. If I ever learn to use the camera and the computer, I’m going to post photographs. Oh, and new, our house cost $1900.00. The fireplace with bookcases on each side was an extra $49.00. The wonderful builtin buffet was also an additional $49.00. The lot cost $200. The contractor charged $500 to put it together. The original part of the house was 1700 sf. We finished the attic into two bedrooms, a sitting area and a bathroom. Love it! Be grateful that she sleeps so well for you at night, for the most part. The schedule during the day will come. She was so very accomodating waiting past her due date so you could complete some projects. Now my little granddaughter is showing you who’s really boss! It won’t be long until she’s more in a routine during the day. But fair warning – whenever you think you’ve got it down – something pops up to throw a kink in everything – like teething or such! Sigh – all part of motherhood. But then you look at them and you can’t believe how deep your love for them is. Bwahaha! I have one of those babies too. One day he naps like a champ, the next he’s a little bear and cries all day. Oh well. Lucky for them, they are SO DARN CUTE! More than the socks I love the shirt, super cute! And the expression on her face couldn’t be more perfect for the post. OMG! Your mom rocks! I teared up reading her comment. Eleanor is such a cutie! hopefully the no-napping during the day means you are sleeping well at night? For your sake, I hope so. Aww, don’t worry. The routine will come. I was up ever 3 hours around the clock feeding, changing, playing with my boy. He didn’t understand the sleep concept either. From 6 months he started to sleep through from 6:30pm to 6:30ish am! Now he’s got 4 teeth coming through (at the same time, poor baby) and his routine is mucked up again. Still beats what it used to be like though. i don’t even have a baby and I’m envious of your crib bedding! I’m amazed at how well you’ve managed to keep up your posts thus far! It wasn’t until Little Miss was one that I managed to do ANYTHING, other than feed and change and settle. Also, I’ve been voting for you everyday! love that bedding!! can’t wait to see and read the details of the room :) your girl is adorable!! understand totally, don’t think I left my house for the first six months! she did, however, start sleeping through the night at 3 months, so there is hope! Where did you get the bedding? Its utterly adorable. Oh my… I just want to nom nom nom those footsies! Welcome to motherhood! About the time mine go to college I expect I might get something done again! Your mom is so right (my mom told me the same thing BTW)- every time you think you’ve figured them out, they change the rules of the game on you. Congratulations on the sweet baby!! She’s beautiful. I’ve been voting for you and your porch! It’s by far the best. And thank you for your blog–you and your amazing sense of design are such an inspiration to me. So fun to read each day–especially when it’s so inspiring! What a beautiful little girl!! Oh I want a baby to squeeze right now, my kids are 15, 13, and 11, and don’t allow me to squeeze them much anymore. She should be in more of a routine by 8-12 weeks. I’m just amazed you are still blogging with a newborn, you rock :) Okay, off to vote! She is adorable…. and that outfit is a very close second! A napping baby is completely overrated. Savor the newborn days – they go way too fast. 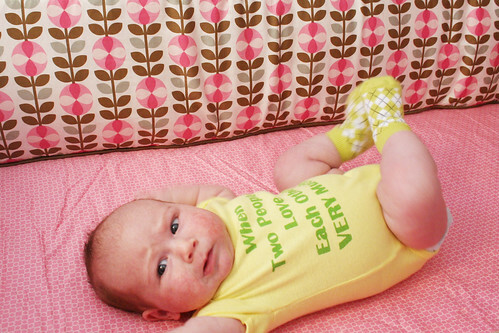 She is adorable and those argyle baby socks are just to die for!!! I love this cute bodysuit! And beautiful color combination of bedding. Oh, and a little sweetie in all of this! I bought some for my niece and they were a huge hit! I am RIGHT there with you! My little guy likes to be held ALL the time and with him being #3 some days other stuff just doesn’t happen. I’m relieved when they all go to bed at night fed, clean, and happy! i hate when people leave unrequested advice on blog comments, but…..
have you read “babywise”? it’s probably the only instructional book i’ve ever read cover to cover. (and then read two more times, ha!) anyway, i’m not saying it’s The Way or whatever, but it really made sense for us, and may be worth a run to the library. Thank you for sharing the good stuff in your life (baby, house, fashion and graphic design)! Eleanor=cherub. 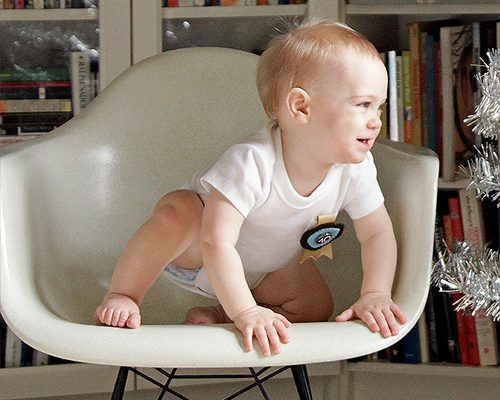 (I love your plan of monthly photos of baby in Eames chair) I want your house (and vote each day)! You have great style and love your graphics (yeah, graphic designers!). But, I have especially enjoyed your mother’s comments… you’re doin’ great! Keep this in mind: the days are long, but the years are short. I am cracking up over her onesie, and I too, adore her argyles. Take your time. We are nothing if not patient. I’m telling you, a swing and/or a bouncy seat will change that non-napping pattern right away. It was one of the few ways I COULD get Eva to nap during the day. Or self entertain. She also loved Baby Einstein dvds and cd’s. They are maybe 20 minutes long, stimulating and soothing all at once. I wish just one person had told me not all babies sleep all the time on perfect schedules like all the books say. It would have made the first 6 months much less frustrating. Listen to your mom. She has wise and understanding advice. Plus, having a baby that doesn’t sleep, just means you have that much more time to enjoy her. It’s so hard when you have stuff you need to do, but it really, really will be over before you know it. I already miss the days of just holding and rocking and loving. Where on earth are those darling socks from?! How could anyone resent you for holding out on the photos when you post a picture of that cutie pie!? I love the bedding btw! I’m amazed at how well you are juggling your very full life these days. The addition of Baby Eleanor in your family, a blog to maintain, your business and if that’s not enough – the BHG Challenge to top it off. I even noticed (on Flickr) that the green hanging planters on your porch are chock full of plants! Just be sure to set aside some time for yourself. Awww…your mom is so sweet. You also have a very beautiful daughter. But they sure aren’t cute when you need a break! lol. Btw, been voting for you for a while now! Hope you win the BIG money! Take your time. We all understand. Besides, I already took a peek of the nursery on your flickr. Love how you mixed the white, pink, and brown together, made the room so bright and clean, yet very cozy. Really like your style. Who says nursery has to be filled with silly soft toys, and cartoon characters painted on the wall? I am due in 3 month, also having a girl. So learning a lot from your posts. Thanks. My baby girl’s the same way!!! Love the bedding and her adorable socks! Oh my goodness she’s just so cute! BUY A SWING!!!! My older daughter would only sleep during the day in a swing (on the high speed) with the sweeper running to help her get to sleep so we figured our new little baby would probably do the same. Little baby Lydia can sleep for nearly 4 hours (if i let her) in the swing with the white noise attachment going in the day time. Dr. Harvey Karp’s book talks about why babies need this and how it is perfectly normal. It is a lifesaver. It is the best advice I have ever been given as a parent. Karp even tells you how to put the baby into the swing to get the best results. My baby has had nasty colic for the last 6wks so I was determined to get her to sleep in the day. good luck nicole. love your blog as always. Sling! I’m telling you. When I commented on this before, I saw a couple of other people did as well. You get all of the pleasure of holding your baby AND all of the satisfaction of getting stuff done. And it makes life so much easier when the get the evening fussie… Swings are nice, too, especially when your cooking or doing something where you just cant’ hold baby. They are eyesores to be sure, but she’ll outgrow it before you know it! She’s adorable! You’re ahead again in the BHG challenge. Hope it stays that way!! I finally got wise and made the bhg voting page my browser home page! Now I will not forget for the next 3 days! I may commented this once before, but it deserves repeating: that onesie cracks me up. I may have to track one down for my various pregnant sisters/cousins. Can’t wait for nursery pics! So yes, Eleanor sleeps very well at night. It’s just the daytime sleep/nap thing that she doesn’t quite go for. ;) We have a swing… she tolerates it for about 10 minutes. Aren’t those socks awesome? They’re from Trumpette. And the onesie was from egg-a-go-go. Eleanor is adorable! And as everyone has said, the naps will come. Eventually. Savor these newborn days, they go SO fast. My baby is eight months old and she’s so different already–not in a bad way, but I miss my tiny little swaddled burrito sometimes. PS–love the socks, we had the Trumpette socks that look like little mary janes. Aurora’s just grown out of them. And the crib bedding is so pretty. I went with a Breathable Bumper because of the SIDS link, but it’s not terribly attractive on the crib. Have you discovered thebabywearer.com yet? I wish I had known how awesome a truly well-fitting sling/wrap/mei-tai could be back with bambino #1. Crucial for parental sanity, IMO! I love Eleanor’s argyle socks! so cute! awww I hadn’t seen her yet! Congrats on your new bundle of joy!